The Career and Technology Centre (CTC) at Lord Shaughnessy High School in Calgary won the Canada Green Building Council’s (CaGBC’s) 2016 Greenest School in Canada competition. The jury, comprising green building experts from across the country, chose CTC for its Energy and Environmental Innovation program. 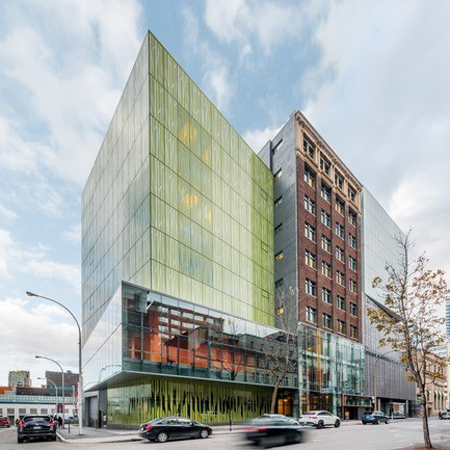 Montréal’s Wilder Building Espace Danse combines architecture with sustainable design. The Wilder Building Espace Danse, a transformed heritage building in Montréal, has been awarded the Leadership in Energy and Environmental Design (LEED) Silver certification in the new construction and renovation (NC) category. The design of the complex required the integration of the industrial building into the urban fabric of Montréal’s Quartier des spectacles district. Ædifica’s construction and sustainable design team came up with strategies to take the Wilder building to the next level of building performance and resource conservation in the pursuit of a LEED certification. By adding a double-wall skin to the existing façade, the team improved the building’s energy performance. Consideration was also given to the integration of natural light and the optimization of views to the outside. “The installation of a translucent insulating glass on the walls of the new construction allowed us to optimize the diffusion of natural light while offering an energy-efficient envelope,” said Patrick Bernier, architect at Ædifica. The team developed a raised floor system to ensure optimal performance of low-speed ventilation and air-conditioning systems as well as to conceal the electrical distribution system of lighting and fire protection assemblies. Other eco-friendly measures included the reuse of the existing building structure and envelope to maintain its heritage value and reduce the quantity of new materials required, the development of a white roof to counteract the heat island effect, the appropriate disposal of more than 4150 tonnes of contaminated soils, and the diversion of more than 78 per cent of construction waste from landfills through recycling. The implementation of the different strategies resulted in a 28 per cent reduction in the building’s energy consumption.